The Fortifications of Vauban are twelve groups of fortified buildings that form a defensive ring around France. They were constructed by Sébastien Le Prestre de Vauban (1633-1707), military engineer of King Louis XIV and influential far beyond the French borders. The remaining sites include both fortifications and various kinds of military buildings. Longwy is situated at a strategic location near the French borders with Belgium and Luxemburg. And that's exactly why Vauban was put to work on it. 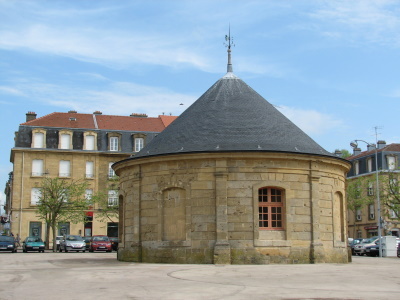 Longwy is one of the four 'new towns' among the Vauban sites on the World Heritage List. After annexation of this region (Lorraine) by France in 1679, a new town for military purposes was built from scratch. The town consists of an upper and a lower part. This region has been hit hard in the past by the closure of its steel industry, and it doesn't look to have recovered too well from that yet. Especially the lower town is quite gloomy. 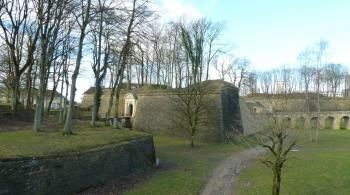 The 18th century Vauban fortifications are in Longwy-Haut. It's a small town, and I could easily park my car at its central square. That's where you'll find two of the landmark sights: the Saint-Dagobert Church and one of the five wells designed by Vauban. The wells were hidden under little bulletproof buildings with a conical roof. They were to supply the military and the civilians with fresh water during a siege. And sieges there were many here, until the town was severely damaged in 1914 during WWI. Leaving the town center via the pretty Porte de France, it's possible to walk along 50% of the fortified walls (the other half was destroyed). It's a fine half hour walk on a sunny day. The ramparts are two layers thick and have many sharp edges (like points of a spear). The whole system was hexagonal in shape. It might not look extremely interesting to the casual visitor, but I suggest that you read the over 3,000 pages long nomination dossier that was supplied by France to get a real feel for the scale of Vauban's works. I visited Villefranche-de-Conflent in August 2017. The town is awfully picturesque (it is also on the register of the Most Beautiful Villages in France) and very tiny, literally two streets and a square. The components of the WH site brought mixed impressions. The ramparts are very imposing when viewed from outside the city walls, but I found touring them slightly disappointing: for all the history and all the good preservation, you basically end up walking a couple of kilometers of pathways of different width, with very little to see except a few largely empty courtyards and chambers. If you are expecting elevated perspectives of the town, you will not find much to choose from. Cova Bastera is a cave complex ending in a fortified chamber overlooking the town. It is the only component that offers free entry. The caves pale in comparison to the nearby Grotte des Grandes Canalettes (which has nothing to do with Vauban), so make sure you visit Cova Bastera first. Fort Liberia high above town takes about 20 minutes of climbing up the stairs even from the most athletic. It is certainly worth an effort. Inside, there is a great example of a self-contained military post, with barracks, service areas, a church, and beautiful crenellations. If you descend by the underground passages (750+ steps, not for claustrophobic), you will come upon an open landing with unobstructed panoramic views over the town. Time allowance for all components of the WH listing: ~3 hours. I ended up spending nearly 8 hours in the tiny town, but that included the aforementioned Grotte des Canalettes and a very long lunch. The latter scuppered my plans to also visit the nearby Mont-Louis, but I expect that a more disciplined traveler should be able to accomplish both in one day if so desired. I visited the citadel and town of Mont-Louis, one of the inscribed Fortifications of Vauban, in the spring of 2013 as part of a day tour from Barcelona. Mont-Louis is located in the Pyrenees Mountains in southern France, and I thoroughly enjoyed wandering through the town and around the citadel. Vauban has been recognized as a superb military engineer, and it was fascinating to see the trenches separating walls in the fortified citadel, as well as turrets and towers providing line of sight and defense. As has been mentioned in another review, the main part of the citadel is closed, as it is currently a training ground for French Army commandoes. I was amused to see an obstacle course had been constructed along the rear rampart of the citadel in order to train the commandoes. Despite the closure of the central portion of the citadel, I was able to view quite a bit of the engineering Vauban employed in the construction of the citadel and the walled town, and it was well worth a visit. Also of note at Mont-Louis, but not recognized as part of the World Heritage inscription, is the world's first solar furnace, which is bright and visible upon arrival to the town. Logistics: Mont-Louis can be visited via private transportation or tour, or via the French rail network's Little Yellow Train (le Petit Train Juane) which traverses the Pyrenees. I visited yet another set of Vauban fortifications in July 2016. This time I visited the sites near La Rochelle, namely the inscribed citadel and forts of Paté and Médoc de Blaye/Cussac-Fort-Médoc and the citadel and walls of Saint-Martin-de-Re on the Ile de Re, as well as the non-inscribed walls and fortifications at Ile d'Aix. The great weather, sandy beaches and friendly people helped to have yet another positive experience with this inscribed series. I now visited 8 out of 12 inscribed sites and apart from the ones which are currently used as prisons, I'd say that all are worth visiting if you happen to be nearby. So make sure to keep your eye on their location and at least stop for a quick visit if you can. I have been to the Fortifications of Vauban in Longwy during an 8 month evangelical missions trip to France in 1994. Longwy was our base town. The Fortifications are awesome! I would walk around them a few times a week when the weather was nice. It was neat to see other people enjoying the area as well. I highly recommend checking them out if you're ever in that area. I would also like to add that the French people were some of the kindest and friendliest people I have ever met. Vauban was a famous general during the reign of Louis XIV, but today he is better known for his achievements as a military engineer. He built and modernized countless fortifications in order to establish a defence ring along the French borders. More than 30 projects were built from scratch: forts, citadels, city walls, towers and even entire towns. His genius was that he perfectly adapted the constructions to the specific terrain. This serial WHS comprises twelve well-preserved and exemplary sites. So far, I visited six of them on different trips: Mount-Louis and Villefranche-de-Conflent in the Pyrenées, Longwy in low mountain range, Neuf-Brisach in the lowlands, and most recently Saint-Vaast-la-Hougue and Camaret-sur-Mer at the seaside. In August 2015, we visited the Vauban towers in Normandy and Brittany. The Saint-Vaast-la-Hougue site comprises two fortified towers facing each other to protect the harbour, one at La Hogue and the other on Tatihou island. At low tide, you can walk to Tatihou, it's a distance of about one kilometre from the harbour. We arrived in the afternoon at high tide and we had to take the ferry which actually is a quirky amphibious vehicle (tickets at the Accueil-Billetterie, Quai Vauban). Access to the island is limited to 500 visitors per day, so we booked two tickets by phone a few days before. However, there were only about 15 other people on the ferry at 3 pm, so that I suppose they rarely reach the daily limit. The ferry ride was quite funny, though I would have preferred to walk because the oyster and shellfish banks are visible at low tide. 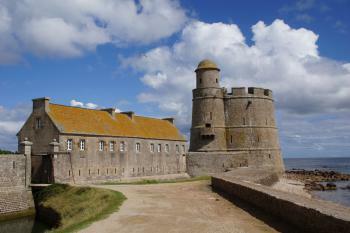 The Vauban tower (photo) is just a short walk from the pier, the island is only 30 hectares in size. The tower, the adjoining buildings and a chapel are open to visitors. You can climb the three levels up to the platform, from where you have a nice view of the island and the coast. It was a nice trip, though there is not much else you can do: a maritime museum, a garden, the walk along the beach. Large parts of the island are a bird sanctuary and not accessible. The La Hogue tower is within a military area and is open only on weekends in summer, it was already closed when we arrived. From the outside it looks similar to the Tatihou tower. The Vauban tower in Camaret-sur-Mer is currently (2015) closed for renovation, so only worth a detour if you are nearby. 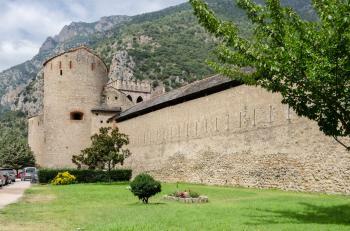 In May 2014, we visited the Vauban sites in the Pyrenees. Villefranche-de-Conflent is a lovely medieval village, popular with tourists, it is also one of "Les Plus Beaux Villages de France". Vauban modernized and reinforced the existing medieval walls and built Fort Liberia on a plateau high above the village. The fort is accessible via a stairway of 734 steps and can be visited on a self-guided tour with leaflets in various languages. The city walls are also accessible. In contrast, Mont-Louis is a rather sleepy town. The site consists of two parts: the fortified village and the citadel, both built from scratch. The citadel is still used by the French military and only accessible with a guided tour. It is about 40 minutes by car between the two villages, but you can also take the Train Jaune, on the French T-List since 2002. Neuf-Brisach was Vauban's last work, a planned fortified town. The layout is a regular octagon, the residential blocks were laid out like a chessboard around the central square. There are two lines of walls around the city forming a star-shaped defence system of bastions, ravelins, ramparts and towers. All this is very well preserved. I visited Neuf-Brisach several times when I used to live nearby in Freiburg. The best is to walk on a sunny day all the way around the city on the inner and outer walls, you will get a good idea of the scale of the system and the principles of the construction. Longwy is also a planned town with many similarities to Neuf-Brisach. The differences are that Longwy is located in the low mountain range and that there is only one line of fortifications. But most importantly, in Longwy only about half of the bastions have been preserved. The six Vauban sites that I have visited so far are very different in terms of accessibility and attractiveness for visitors. Neuf-Brisach and Villefranche-de-Conflent were the most interesting. The visit to Saint-Vaast-la-Hougue was also enjoyable, but more because of the location than the architecture of the towers. The route home from a third trip to Luxembourg allowed me to finally pay a proper visit to one of the listed sites by having a swift breakfast at the upper town in Longwy. It is only a small place so a quick stroll allowed us to explore most of the key aspects of the site. The pointed angular casements stood out, like they did at the other Vauban fortifications I have visited. Even with a limited grip on military tactics I could see their function and how they were incredibly suited to the needs of their day. When you factor in that places like this surround the whole country you can start to see their outstanding universal value. The stroll brought us to the big empty square in the centre, which was home to the well and a few other points of interest. But it was mostly just a void used as a car park. Then it was time to head off. It was certainly a more interesting visit than my previous trip. When thinking about the process that led to all these towns and forts surrounding the whole country it is very easy to ascertain how they are a great testament to a period of political and military thought. In summer 2015, I travelled France and visited Neuf-Brisach (OK), Besancon (fantastic system of forts, most of them can be seen from the walls of main fort), Camaret-sur-Mer (small and rather poor WHS closed for maintainance 2015 but otherwise a very nice place to visit), Saint-Vaast-la-Hougne (unaccesable due to French military area), Arras (now completely opened, fort accessible by car and foot but no activity for tourists) and at last Longwy (worth a visit). General lack of information in other languages than french, best i Besancon where they have found out about that. I visited a couple of Vauban sites in June-July 2013. I visited the château of Bazoches first, owned by Vauban in the past, although it was not included in the list. Then I visited Besancon with its high city walls and Fort Griffon but still I felt that these were nothing special. Last but not least I visited Neuf-Brisach and I was rewarded for my perseverance. 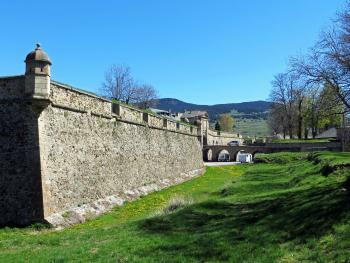 The fortifications of Neuf-Brisach are still in good condition and so I decided to go for the 5km circuit. There are two lines of defence and aerial shots clearly indicate the star shaped fortifications of Vauban and the regular layout of the incredibly small "city"! There were signposts with information all round the circuit so I could appreciate different aspects of the fortifications. Definitely go for Neuf-Brisach if you happen to be close by. Similar to the Routes of Santiago de Compostela, this is a site that spreads across the length and breadth of France. 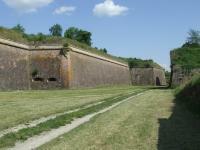 It consists of fortifications designed by the famous military architect Vauban, who was commissioned by Louis XIV. to devise a plan to defend France's borders and coastlines. 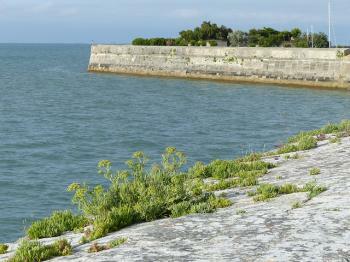 The first site I visited was St. Martin de Ré, on the pretty Isle de Ré, just off La Rochelle. This was a bit of a disappointment, since the town itself is very nice, and there are also massive fortifications everywhere, but the citadel itself is still an active prison and can't be visited. The next visit was more successful - the triple fortification at the Gironde, built on both banks and an island to defend the port of Bordeaux. Blaye, on the northern shore, features a huge, quite well-preserved citadel, and you can take a ferry to the southern shore to the much less well-preserved Fort Médoc (about a 30-minute walk from the ferry terminal). The island on which Fort Paté sits cannot be visited, but can be seen from the ferry (even though you can barely make out any fortifications). On a separate trip to Alsace, I went to Neuf-Brisach, just a few kilometres from the pretty town of Colmar (regular bus connections available). It was constructed in the completely flat Rhine plains, so Vauban was able to build his version of an ideal military city from scratch - a heavy fortification surrounding a small town with a garrison church and a parade square. If you are in the area, you may come across the Barrage Vauban in Strasbourg, a defensive bridge/lock on the edge of the Old Town which I think would make an interesting addition to the WH site. A third trip brought me to Besancon in the Franche-Comté. The citadel dominates the city and includes several museums and a nice zoo. One ticket covers all attractions, and it is quite easy to spend several hours there. I would recommend to take a bus to go up and then walk down past the cathedral and the Porte Noire, a Roman triumphal arch. I also walked by the Fort Griffon by the train station (also on the list), but it houses a college and can only be seen from the outside. As to how to see and what you can see at the site in Arras, all you have to do is to try to take paths around the fort that are closest to the fort. Well, you can hardly see the inside of the fort, but you can see the outside, and this is all you can see there. These paths are also created for hiking and biking. One can actually walk around the fort and see the fort at various points along the way. Also remind you that Arras' belfry is also inscribed in the WH list. So Arras has TWO WHSs! 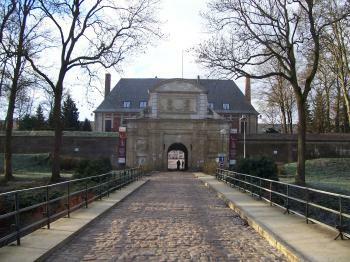 Arras - small fort in the city, occupied by the Militaire. (Arras is also home to some monumental war cemeteries, and the Museum of the Company of New Zealand Tunnelers at the Wellington Quarry). I had already visited several Vauban fortifications; however at the start of 2010 I finally visited one of the fortifications that is inscribed on the list. From Lille I decided to visit the citadel at Arras. I apologise to any people out there who have affection for this town but this was one of the worst WHS visiting experiences I have had. The citadel itself was located about a 20 minute walk from the station through a pretty uninteresting part of town. When we got there the interior was closed, which we were pretty much expecting however I had read that there were walks around the outside that could give us a better look. This really was not obvious from the entrance and the banks of the moat just looked overgrown and uninviting. As such after taking a few pictures we just moved on. It seems that you can view something of the fortification from around the back, however there was nothing to indicate this, and we were looking pretty intently. Next to the citadel is a First World War cemetery designed by Edwin Lutyens which was reasonably nice. We then walked through yet more uninspiring suburbs to the centre of town. It had the potential to be very nice, however something about the place was very uninspiring, after walking around the main ‘sights’ including the lovely belfry we decided to have a coffee that turned out to be exceptionally miserable. Then we just trundled of to the train station preferring to spend our remaining hour and a half there reading rather than exploring more of the town. I’m sure some people will love Arras, it is seems to be especially good if you are looking for 1990’s French clothing, however I can’t remember a place I have enjoyed less. Prior to my uninspiring visit to Arras I visited the Citadel in Lille (a very nice Flemish city with a French twist). This is not part of the World Heritage inscription, I guess because it is still used by the French military. However it is in a much better state of repair and you can see a quite a lot of it. The exterior is easily viewable from the nice tracks that run around the whole of the citadel. Here you can really get a feeling for the shape of the fortifications. The track was being used by a lot of locals for the walking of dogs and children trying out the bikes they got for Christmas. To make up for the fact I had forgot my running shoes I hired a Segway from the car park which was an exceptionally fun and rewarding way to see the entire complex. This provided a much better visiting experience than the one in Arras, and Lille was a much nicer city. In addition to these I have seen several other Vauban fortifications, the most impressive were Ypres in Belgium and the walls around Luxembourg. There are a lot of his works all over France but I can't really work out why some are included in the inscription and others are not. They are interesting sites to vist and can be pretty rewarding, I just would not recommend visiting the one in Arras. Msr Vauban also remodelled the town ramparts of delightful Montreuil-sur-Mer (inlan from Le Touquet, and not now on the sea at all due to silting) and one of his earlier forts was Fort Mahon, Cap de Calais, near Ambleteuse. I've been to Neuf-Brisach (Neubreisach) in Alsace a few times (on my way to nearby beautiful and touristic Colmar). It is a small town near the German border with monstrous fortifications. They are so huge and out of proportion for the small and insignificant provincial town that they almost look ridiculously bombastic. Nonetheless, they are really impressive. Other than the walls there is nothing to see in Neuf Brisach. Includes former TWHS Ligne fortifiée du Nord de la France sous le Ancien Regime: frontière commune avec la Belgique (1995), which included the former TWHS Besancon (1984). Prison: Tatihou island was used as a prison for Germans during World War I.
Walled cities: Besancon, Villefranche-de-Conflent etc. Notable Bridges: Pont d'Asfeld (location 1283-004): Designed by Vauban. Work on the bridge, led by the Marquis of Asfeld, was completed in 1731. Undergoing Restoration or Repair: The tower in Camaret-sur-Mer is closed for renovation (full year 2016). Extended from original TWHS: From Besancon (1984). 227 Community Members have visited.